Plateau Below is a Bloomington, IN quartet releasing their debut LP, Still Paradise, on March 4th via Jurassic Pop digitally and on 100 limited-edition cassettes. 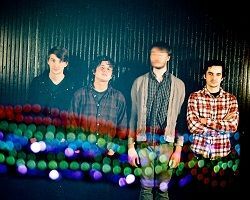 Having been together barely over a year, they layer catchy vocals over traditional rock compositions that capture indie rock in the truest sense. During the recording of the LP, the bass, drums, and rhythm guitars were recorded in live takes giving every track that classic unpolished (in a good way) sound that is lacking in today’s music. We have the lead single “Clearhead Real.” The song is shining all over with glorious, slightly off-kilter guitars and cracking, yet comforting vocals that take us back 20 years ago during the peak of, arguably, the last great rock movement. It serves as a fantastic introduction to a band just getting started. Give it a spin below.